When @LittleMrGray was born, he came with this uber slick straight hair which I hoped day-in and day-out would turn into curly ringlets and alas between months 7 and 8 I finally got my wish granted! He now has a great head of 3b/3c type curls (I'm a 3a/3b and his dad is a 3c/4a) which we are letting grow and are giving special care to in order to carefully preserve his curl texture. Now, we will absolutely give Gray his first real hair cut at some point down the line; but for time being - we love the way his curly ringlets adorn him and if we do any kind of cutting over the next year, it will only be with scissors to even it out at the very most. Babies and their hair go through many changes in their first year. Some babies shed their hair almost completely, while others like Gray, barely lose any. In fact, Grayson probably shed at most for about two-weeks minimally on the sides of his crown, before coming to a full stop and starting the growth of new hair. Instead of losing hair, his hair texture began to slowly convert into what it looks like today. An important thing to keep in mind while reading this post is that no two heads of hair are the same, thus, this guide is a list of products that I have personally tried and tested with my son which I find work amazingly well for his hair - *at this time*. I emphasize on *at this time* because just like adults, a baby/toddler/child's hair is ever-evolving. What works for Grayson now may not work for him later, just like what works on him usually, may not work for you or your child at all. So if you have a curly cutie at home and are looking for options and recommendations, do feel free to use the list below as a point of reference but remember that your own child's hair regimen will always be unique to them. The hair market is huge. The baby/toddler hair market - not so much; but only if you see it that way. 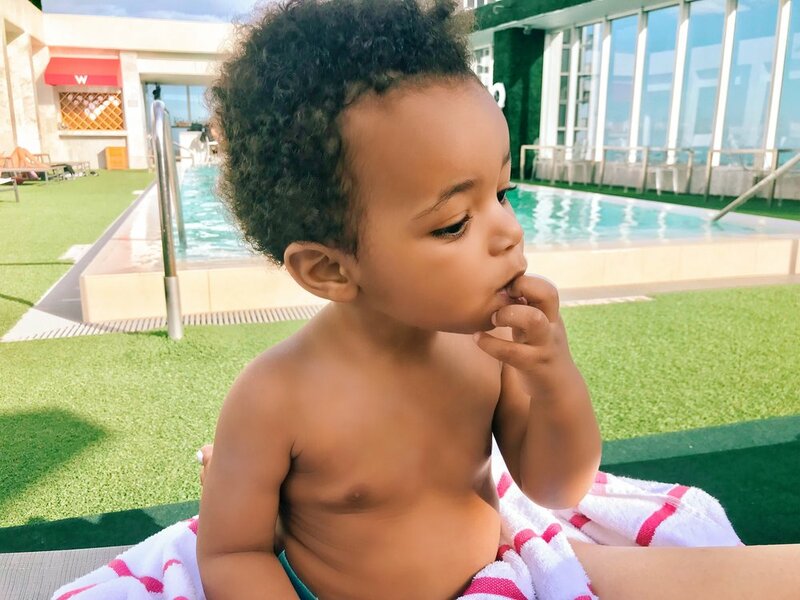 You see, there's only a handful of products out there advertised specifically for baby and toddler hair, maybe because they don't require too much maintenance between 0-12 months. Once your kid has a full head of hair that needs taming however, this becomes a period where you will experiment to see what works for you. This specific window of time is where a huge untapped market for hair companies and brands exist. Now, there are some amazing companies creating awesome products that are marketed for children, curly haired ones especially; but it is nowhere near as elaborate as adult-marketed hair products. This shouldn't stop you however. Just because a product doesn't say "Baby" or "Kids" on it does not mean you can't take it into consideration for your child. If you read and research the ingredient list, feel that it is gentle enough for your toddler, and presented for your child's hair type, then what's to stop you from giving it a try? As long as you're testing it out carefully and in small amounts, then go ahead! When Grayson's hair was pin straight, and also about 1/3 in quantity of what it is today, it was easy to wash each time he bathed. His new hair now however, is not washed as often and for great reason. Curly hair can become overly dried and prone to breakage. The frequent washes can do away with your natural oils and thus begin drying out your stands making them more delicate than they need to be. So as of now, we currently wash Gray's hair 1-2 times per week. Prior to his washes, I like to massage his scalp with about a teaspoon of extra virgin coconut oil. I usually leave in for about 30 minutes while we get ready for bath time, and then wash it out. Now, some people choose to actually use coconut oil as an oil for moisture upon styling; but with Gray's current texture, I find that if I leave coconut oil in and don't wash it out, his hair will end up being too greasy and weighed down regardless of how much of a small amount I use. As coconut oil is packed with endless benefits for hair, this is a great way to keep and treat his precious curls with the moisture that they need. 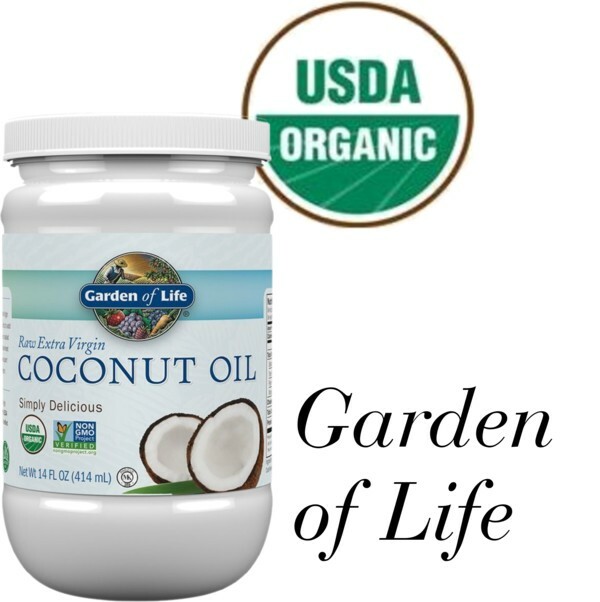 For Gray, I like to use the Garden of Life Organic Extra Virgin Coconut Oil - Unrefined Cold Pressed Coconut Oil - $6.70 @ Amazon, but any extra virgin and organic coconut oil will work fine! To Wash, Condition and Be Free From Poo! I've probably tried and tested about 6-7 different shampoos, conditioners and combo 2-in-1's on Grayson, and none ever really left me satisfied with how his hair would turn out. Curls demand a lot of moisture so it was important to find something that would provide this, without weighing his hair down, or leaving it an overly greasy mess. More importantly, it needed to be free from sulfates, parabens and silicone. After giving a few different products a test run, I consulted with a friend who's son packs a head full of gorgeous 3c-type curls and asked her what she used. Once she gave me her answer, I had a full blown 'duh!' 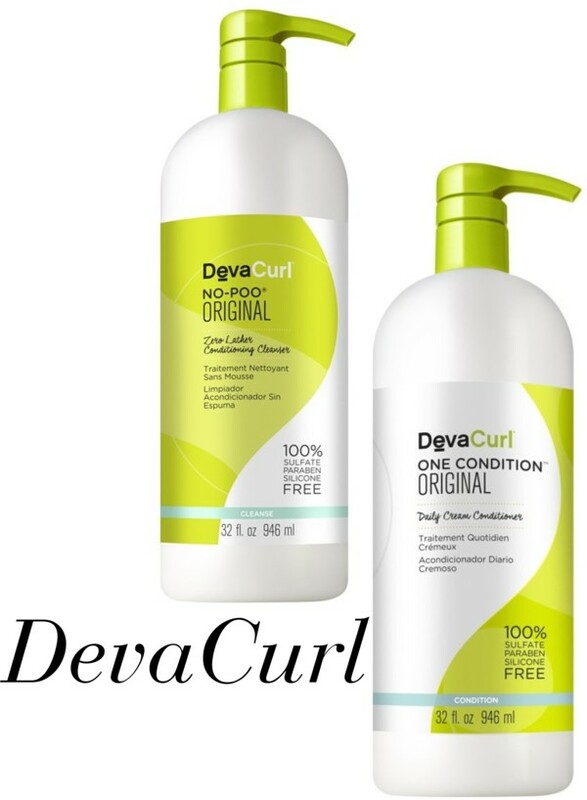 moment and shook my head because the solution was just so obvious that it was a shame I had not considered it before: DevaCurl No Poo-Zero Lather Conditioning Cleanser - $21.95 @ Amazon, to wash, and, Deva Devacurl One Condition Conditioner - $15.50 @ Amazon, to condition. DevaCurl has a true almost cult-like following of curly-haired devotees around the world, and with great reason! Their products are known to hydrate, define, and maintain the health and texture of your curls without stripping your strands or scalp of any oils, and is free of the sinful ingredients found it a lot of other widely available hair products that work against the promotion of your hair's ability to curl. The shampoo alone is so moisturizing that I can use it alone, without the need for the conditioner if I chose to; and both products are super gentle on @LittleMrGray's scalp and he has never shown any kind of discomfort or irritability to his eyes during a wash. So far this is gold for us on wash day, and they're both formulated for daily use as well if that's your thing! Baby combs are usually fine-tooth, and baby brushes are usually very soft. 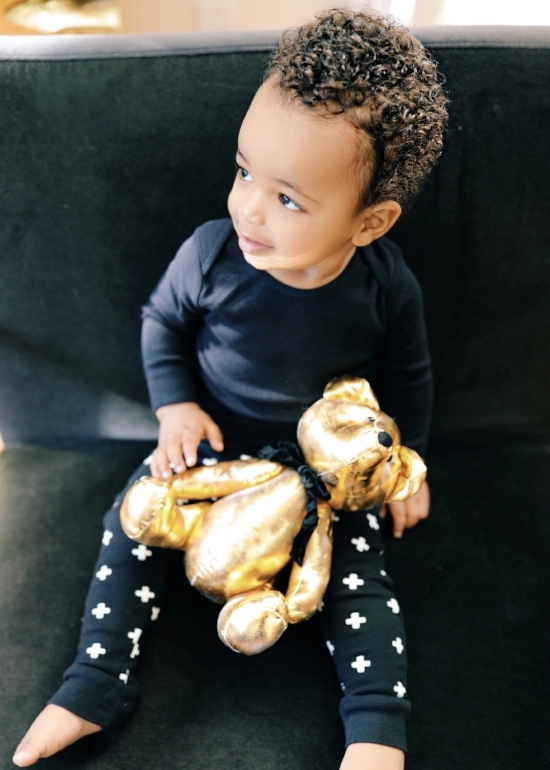 While the standard baby brush worked for Gray when his hair was slick and completely straight, it does no justice to his curls now. As for the standard comb, I'm not a fan of using them on his current texture of hair; and his hair isn't really long enough for a wide-tooth comb either so I've found my satisfaction in two brushes for his grooming process! When in the bath, once I've shampooed his hair, I like to finger detangle his strands. After conditioning, I then follow up with the Denman 5 Row Classic Pocket Styling Brush - $9.71 @ Amazon, which is also a curly-cult-classic because of how gentle it combs through curled strands all the while effectively making it's way through tangles with little to no breakage. A plus about this particular model is that it's smaller than a full-sized version, making it much more suitable for brushing through a little one's head. Aside from our Denman, once we are done with bath time and ready for styling, I use a wooden paddle bristle brush that actually came with a baby brush set that I received as a gift to distribute any hair product evenly among Gray's strands. This wooden bristle brush is made of anti static solid beech wood. It's great because the wooden bristles feel like little massaging fingers on your little one’s scalp. Like the Denman, it is flexible so it detangles toddler’s hair without pulling. Massaging increases scalp circulation, and brings lovely nutrients to the hair follicles which results in healthy shiny hair and peaceful relaxed kid. This brush can be purchased as part of a set on Amazon, by clicking here: Wooden Baby Brush Set by The Joyful Baby - $18.97 @ Amazon. After I wash Gray's hair I'm very careful to only pat dry his hair - his hair isn't long enough for me to wring out. I never like to rub his wet hair with a towel as it's bound to cause friction and absorb all of the important moisture that we worked so hard to get in during the wash and condition process, so once it's free of excess water, I'm now loving the use of this gem that a cosmetologist friend recommended and uses on her babies as well. Curls is a curly-hair dedicated product line that has an expansive selection of items for all kinds of coils! They also have an organic baby curl line as well, and their It's A Curl - Ring Around the Curlies - $17.99 @ Amazon, is an amazing leave in cream for your little one's hair. For Gray, I like to use a small dime sized drop to work into his hair. To follow the Ring Around the Curlies, I also like to add in about a nickle-sized drop of Oyin Handmade Hair Dew - $12.56 @ Amazon. Now this stuff smells sooo amazing - oh em gee! I actually discovered this at Rite Aid one day and fell in love when I tried it. The family-owned company, Oyin Handmade, produces a great line of hair and body products, that are all made from natural, organic, and food-grade ingredients. The line has products for men and women that are all gentle, cruelty-free, and moisture focused. What I love about the Hair Dew most, is that it's light enough for daily use and refreshing, so it's become my go-to product when combing through Gray's hair for any knots or tangles in between wash days as well because it can be used on wet or dry hair! Learn more about Oyin Handmade, by clicking here. To complete our moisture-locking regimen the icing on the cake involves an amazing hair cream that I discovered on my own while digging through Amazon! It’s the As I Am DoubleButter Cream - $14.99 @ Amazon, which is an amazeeeeeee-zinggggg rich moisturizer that contains the absolute best oils and moisturizing ingredients for hair: cocoa butter, shea butter, castor oil, jojoba oil, sugar beet root, wheat germ oil, vegetable glycerin, wheat protein, pro-vitamin B5 aka panthenol and lanolin! It is absolutely a rich hair butter but yet buildable and light enough that you can use it daily! I love that the ingredient list is super easy to read, and this goes into @LittleMrGray’s hair oh-so-well! I mean, I’ve tried many hair butters before but this one knocks them all out of the box. Nothing in this leaves your hair hard or looking overly greasy and weighed down. It is absolutely moisture magic in a jar and I am so in love with it, I swear! After we’ve washed, conditioned, detangled and moisturized; there can be a day or two we may face where hair may get a bit too unruly. So for this I searched high and low for a baby-safe, gentle and flake-free hair product that offered a small bit of hold and curl definition. Thankfully I didn’t have to search so hard because the same line that makes that amazing DoubleButter Cream that I just raved about also has a fantastic line dedicated to babies and children named As I Am Born Curly! In the line, I absolutely love the As I Am Born Curly Argan Curl Defining Jelly - $13.66 @ Amazon, which is an awesome certified organic soft hold and flake-free light weight gel that contains organic vegetable glycerin, argan oil and buriti oil. It is in no way sticky to the touch and defines curls so wonderfully! I find myself using this when there’s lots of humidity in the air and I need Gray’s hair to keep tame. I love that it doesn’t harden his hair, isn’t drying, and doesn’t leave visible residue or that nasty cast that most gels leave behind. What I probably love about this brand most is that their children’s line all proudly carry the NSF seal, certifying that they all contain organic ingredients. As I Am Born Curly is the first and only NSF Certified Organic beauty product line for naturally curly babies and children. They are put through so much testing to assure that not only are organic certification standards met, but also to ensure that they are safe for your child. Love. Love. Love! As noted earlier, I’m sure this list will evolve, just as Grayson and his hair will, but I am super happy with the regimen we have going now and more importantly how his hair is responding! Do you have a curly cutie at home? If so, what are you using? Drop your faves in the comment below! I’m always looking for new things to try! Four Months Later: Yes, We STILL Love Our Goat Milk Toddler Formula!